Mercedes-AMG has revealed a hot version of the A-Class ahead of its public debut at the Paris Motor Show in October. Badged the A35, the entry-level AMG features a 2.0-litre turbocharged petrol engine producing 306PS and can hit 62mph in 4.7 seconds. Top speed is limited to 155mph. 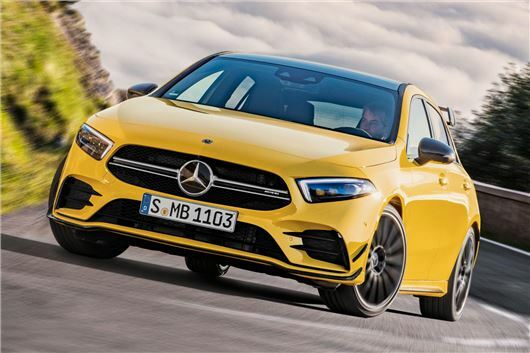 Sharing a new platform with the regular A-Class, the Mercedes-AMG A35 is four-wheel drive and will rival the Audi S3, Volkswagen Golf R and BMW M140i when it goes on sale next year. An even hotter version, badged the A45, will be launched later in 2019. Like the A45 version of the old A-Class, the A35 doesn't go for an understated look. The 18-inch alloy wheels are aerodynamically optimised, while the rear's dominated by a large lip spoiler and two round tailpipe trims. There are no fewer than five selectable drive modes, including slippery, comfort, sport, sport+ and individual, while the optional adaptive dampers provide three different levels of firmness. The interior features leather seats with red stitching and seat belts, along with the new MBUX infotainment system. Customers can choose between three AMG display styles for the instrument cluster, while an AMG-specific centre console in piano lacquer has additional buttons that control the ESP, manual transmission model and adaptive dampers. Prices are yet to be confirmed but the A35 is likely to start at around £36,000 when it goes on sale after its debut at the Paris Motor Show in October. My dad used to have an A35 back in the 60s. Yes, it's top speed was limited to 55 mph.